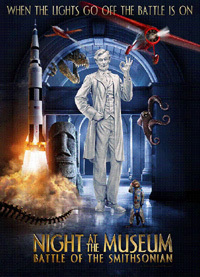 The centerpiece of the new film "Night at the Museum: Battle of the Smithsonian" will be bringing to life the Smithsonian Institution, which houses the world's largest museum complex with more than 136 million items in its collections, ranging from the plane Amelia Earhart flew on her non-stop solo flight across the Atlantic and to Dorothy's ruby slippers. Visit the sites and artifacts that inspired the film. Many of the Smithsonian's much-loved artifacts had starring roles in the film. Make a quest to find them. Use the interactive treasure maps to get started, print copies to take on your Smithsonian visit.